Weer een nieuw boek! – DOT onderwijs in beweging! De komende weken zal ik, naast mijn andere werkzaamheden, het boek “Visible Learning – Feedback” van John Hattie & Shirley Clarke gaan lezen. Uiteraard zal ik daarna een korte samenvatting geven van het boek. Feedback is one of the most powerful influences on learning and achievement – if you get it right. 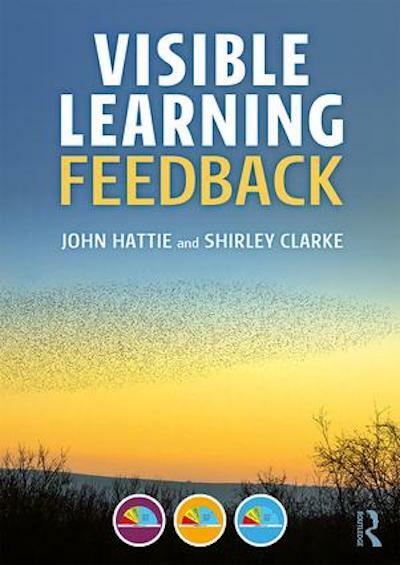 In the new book “Visible Learning Feedback” John Hattie and Shirley Clarke dive deeper into this core message of the Visible Learning research and switch the conversation from the giver to the receiver of the feedback message. It seems the art of teaching is the ability to listen more and talk less. In “Visible Learning: Feedback” Hattie and Clarke approach the theory and practice of feedback and aim to resolve the paradox of the power of feedback vs. the variability of feedback. They discuss the importance of surface, deep and transfer learning; they show how to make use of student-to-teacher feedback and peer-to-peer feedback; and they point out the power of within-lesson feedback and manageable post-lesson feedback. If you are interested in getting feedback right, this book is an excellent starting point. Visible Learning: Feedback by John Hattie and Shirley Clarke. Published by Routledge in August, 2018. 176 pages. You can order the book on Amazon or find it in a library. Chapter 1: What is Feedback? ISBN 978-1-13-859989-5 (Paperback). ISBN 978-1-13-859988-8 (Hardcover). Watch this short video in which Shirley Clarke explains the concept of feedback, success criteria and formative assessment. The main ideas can also be seen in action with 5 and 10 year-old children in the classroom. Volgend berichtVolgende Een vernieuwend 2019 gewenst!